(MARINA) The deliciousness this bread holds, the wonders it seeks make me crave it. 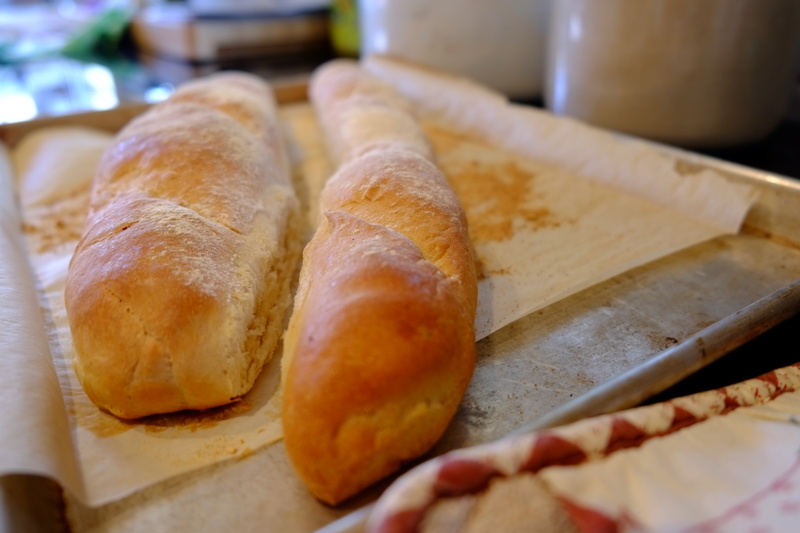 When my mom got home from her bread baking class each week, I would always run up to her and ask if she had baked any Baguettes. She would whip it out and give me a slice. My dog Pearl once stole it from me when I was watching tv. Another fun advantage you get when you are baking bread is that you get to spray the oven. You just take a squirt bottle, fill it with water and squirt the oven to keep it moist. That’s what makes your bread so moist! Now you know the secret on how to make bread. Au revoir! (KERI) Bread. The loaf has amazing powers, don’t you know, and I’m convinced it is the way to world peace. No matter what table you find yourself at, there will be bread. Be it ciabatta, Russian rye, sweet, challah, brioche (oh good lord, brioche) or Wonder Bread, we get happy as soon as we smell it. To break it is to love it and to understand its healing ability. Among all of the yeasty brothers, there’s one chew my family can’t get enough of and one I’ve always wanted to make. The Baguette…that’s right: with a capital “B.” The one, the only, the incomparable…Baguette. As I was browsing our city’s culinary school’s schedule, there it was. 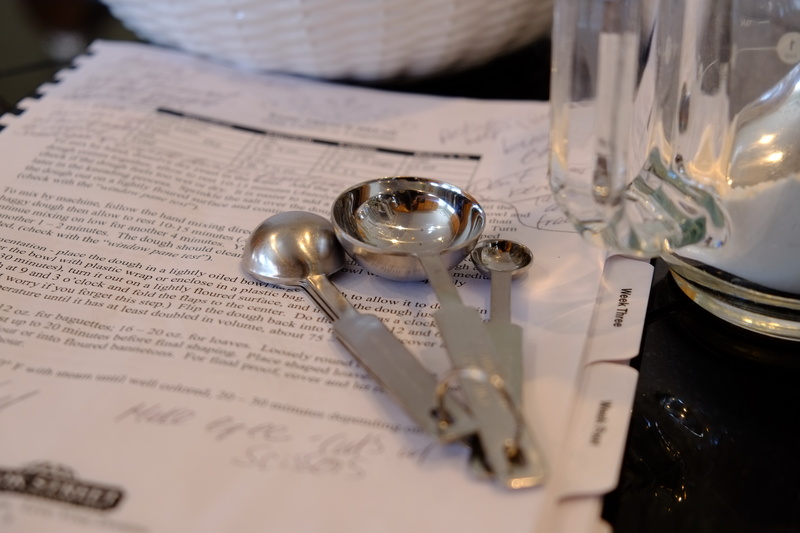 A four-week course on the art of baking bread. Bread. Over four Saturdays, we would learn to make it all, including the Big Daddy Baguette. I squealed. I called my ‘on-sabbatical’ brother (who had recently been trying his hand at baking bread) and coaxed, pleaded, maybe bribed him to join me. Okay, it wasn’t really that hard. 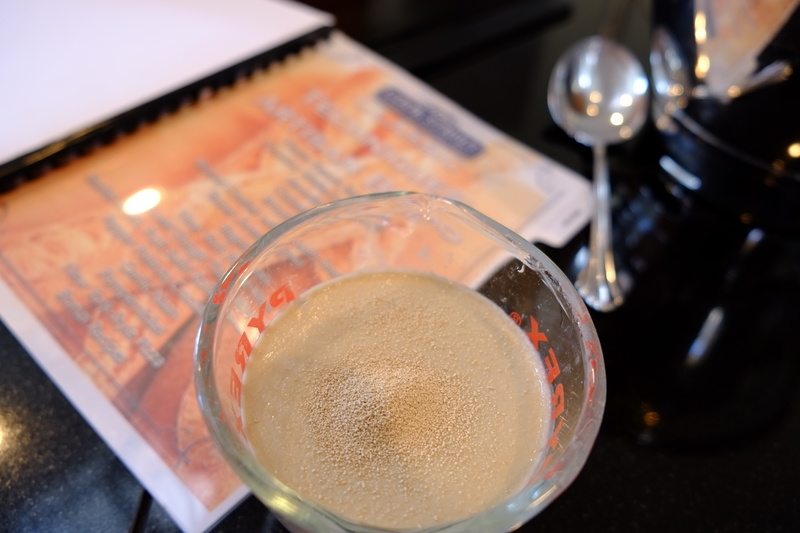 Cook Street in Denver makes learning to bake a little like a long hike followed by a deep tissue massage. You learn, you move fast, you get serious. You eat a breath-taking lunch made by the ace culinary students, you drink wine, you break bread. Every week. This is where I belong. I wanted to snuggle up with the convection oven. I digress. Bread is why we are here today. Did you know baguette has only four ingredients? Yeast, water, flour, salt. That’s it. Then let is rise. Shaping the baguette is so much fun. Pulling and pinching both sides, then pinching it all together. Roll, roll, roll your baguette, then it’s quiet time. Shhhh, baby has to rise. Once the nap is over, hash it a few times at an angle for that true Paris chic. Sprinkle with flour so when it bakes it acquires that true artisan look. The house fills with bread-baking aroma. Oh, Friends. It’s simply too good to be true. Your very own homemade baguette! Squeal! It is the remedy for all ailments. Or at least all bad moods. Sigh. Seriously. There’s no more to say. Bread. Baguette. Don’t be afraid. Make it, bake it and break it with the ones you love. 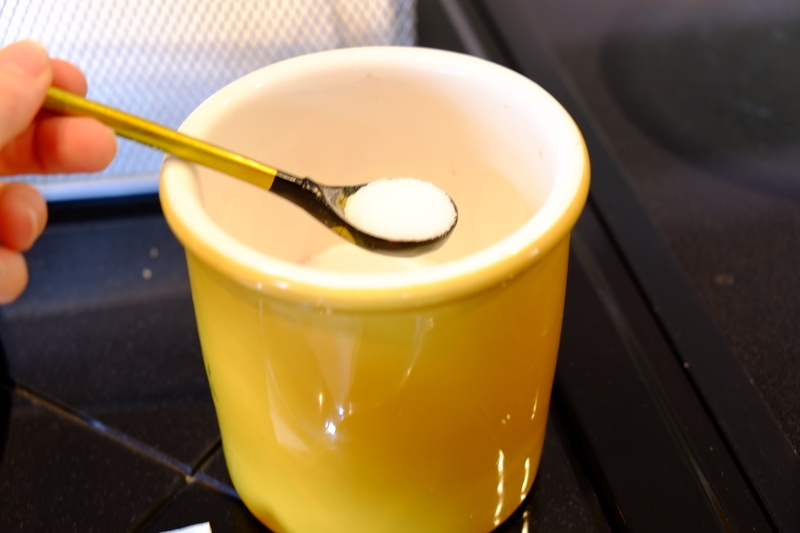 Mix yeast in water with your fingers until it is dissolved. Pour into bowl of standing mixer. 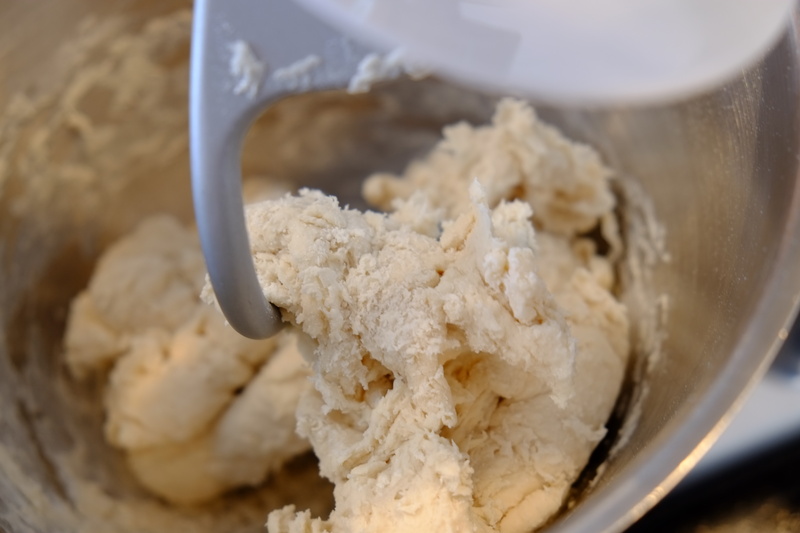 In a standing mixer fitted with a dough hook, mix in the flour until you have a shaggy dough. Allow the dough to rest for 15 minutes. Sprinkle with salt and mix on low to medium for 6 – 10 minutes until the dough cleans the sides of the bowl and it is no longer shaggy. Place the dough in a lightly oiled (with baking spray or vegetable oil) bowl and cover with plastic wrap. After 30 minutes, turn the dough out to a lightly floured surface and imagine it as a clock face: Pull the dough at 9 and 3 o’clock and fold the flaps to the center. Do the same at 12 and 6 o’clock. Flip the dough back into the bowl, recover it and let it rise to room temperature until it has doubled, about 90 minutes. Cut the dough in half. Pre-shape the dough into two flat rectangles. 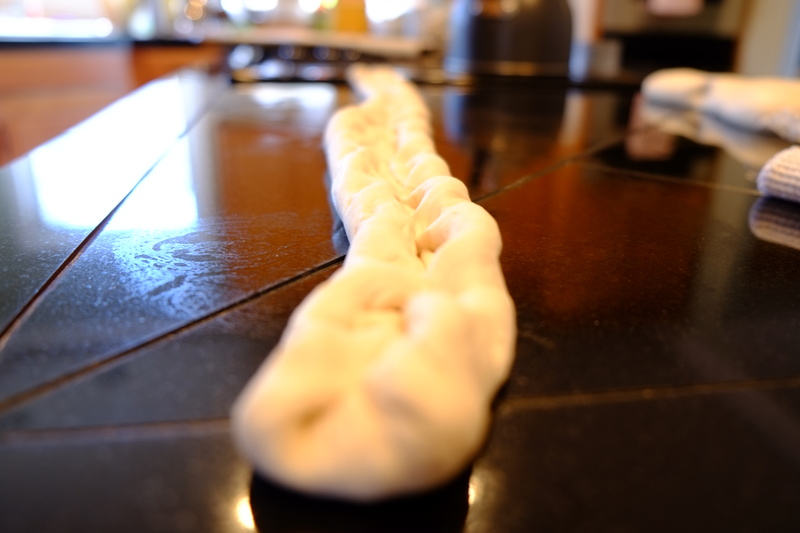 Beginning at the left end, pull the top down and over (using right hand) while you push the dough up with your left thumb. Stretch the right end of the dough as you go. This action will create a little air edge on the top and bottom (see photo above). This video is more fancy, but gives you an idea of the technique. Pinch the edges together to form a log and gently roll the baguette so it is evenly sized. Do the same with the second piece of dough. Place the rolled baguette, seam side down, onto a parchment-lined and floured baking sheet (you’ll likely have to lay it diagonally to fit both on it). Cover with a dish towel (or place it in you oven with the light on – WITH NO HEAT) and let it rise for its final proof, about an hour. Heat the oven to 450-degrees. Spray with water. Score the loaves 3 to 4 times at a diagonal and bake until well colored about 25-30 minutes, spraying the oven and the baguette halfway through the baking cycle. Allow the baguette to cool then slice and go crazy. This entry was posted in Sides and tagged baguette, Bread. Bookmark the permalink.